The new Ford Mustang is one of the most dynamic and athletic muscle cars in the world. This American vehicle is available with several high-performance brakes. You can request information on the model's technical specifications from Malloy Ford. Painted in a bright red finish, the signature Brembo brakes are available for the 2019 Mustang. These stylish brakes include six-piston calipers and two-piece iron discs for the ultimate durability. Aluminum hats provide extra protection in inclement weather. In addition to having reliable brakes, the new Mustang has custom driving modes. 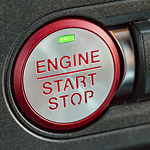 Several toggle switches are conveniently integrated into the dashboard for instant adjustments to the drivetrain and transmission. For example, the Drag Strip Mode is designed to optimize acceleration on a straight road with minimum traffic. The Sport Mode is ideal for long-range driving on a highway with a high speed limit. Additionally, the Normal Mode delivers a good balance of power and efficiency.